I am very excited to be able to announce that Gallereo will be attending this years NewcastleGateshead Art Fair. Gallereo was created from my passion of art, and a desire to be able to help artists to promote their work, and further their careers, no matter what their background, means or ambitions. Gallereo formed as a website builder for artists and photographers, and this part of what we do is going very strong at the moment. We have some absolutely wonderful artists on board, who are creating interesting and diverse works of art, that are showcased on some very nice websites. With the website builder going strong, I have been able to look at ways of helping artists offline as well as online. Gallereo's stand at the NewcastleGateshead Art Fair will be the first time that we are able to offer artists a chance to exhibit their work offline, to a wide audience and collector base. As this is the first time that we will be attending such an event, we thought it only right that we offer the exhibition opportunity to the earliest adopters of Gallereo, who have stuck by us as we've grown and developed. So, we will be proud to showcase the works of Hans Meertens, Mark Jessett, Marion Kuit, Ben Quail and David Waters at the fair. 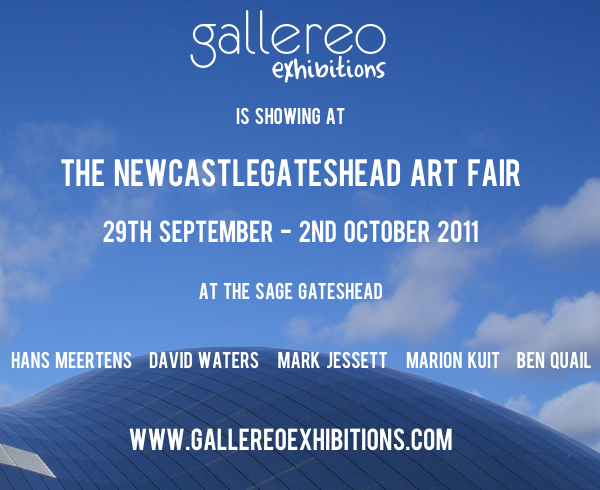 The NewcastleGateshead Art Fair will take place from the 29th September, to the 2nd October at The Sage Gateshead. Information about visiting the event, the artists that we are showing and our future plans for Gallereo Exhibitions, can be seen on our Exhibitions website. I hope that this is just the beginning for Gallereo Exhibitions, and that we will have many more exhibitions opportunities to offer to members of the Gallereo network, in the not too distant future. Thank you to everybody for the support, and I hope to see you at the fair.